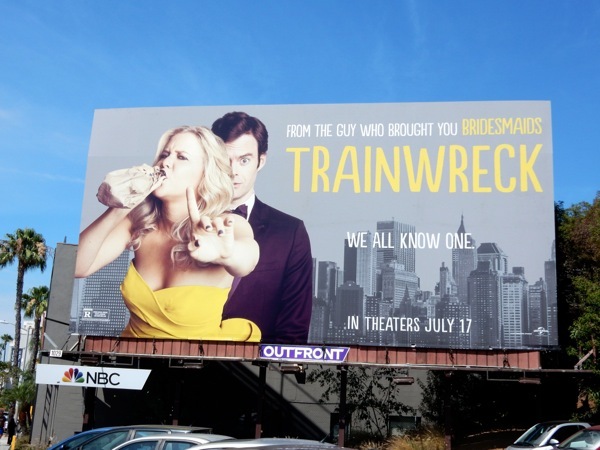 If you've been partying heavily over the long July the Fourth weekend, then these billboards with Amy Schumer drinking alcohol out of a brown paper bag are probably going to resonate with you today as you soberly return to work. 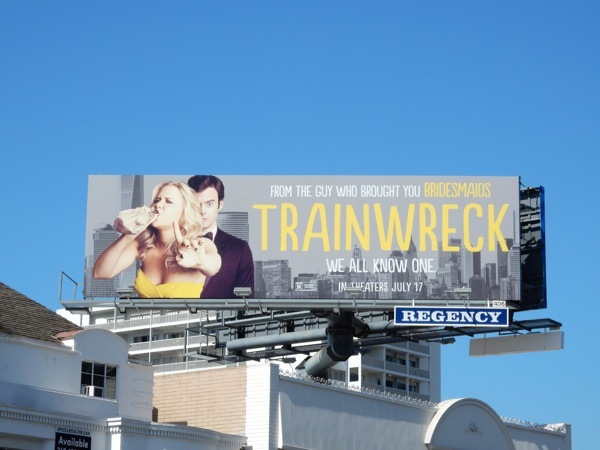 It seems like Amy Schumer can do no wrong at the moment, her third season of Inside Amy Schumer just aired on Comedy Central, she hosted this year's MTV Movie Awards and this Summer she's starring in Trainwreck, which she also penned. 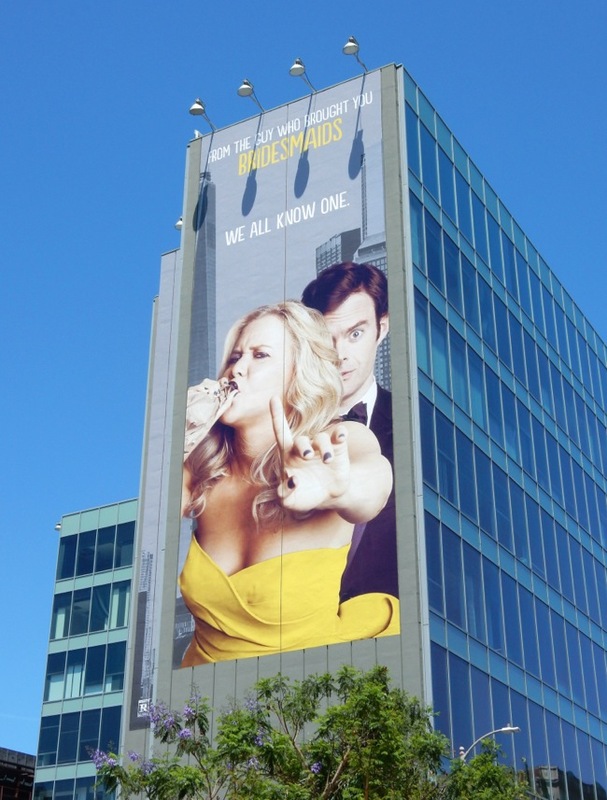 Now she's also getting super-sized and her face is being plastered all over L.A., as she gets slightly wasted in these billboards for the new comedy directed by Judd Apatow. 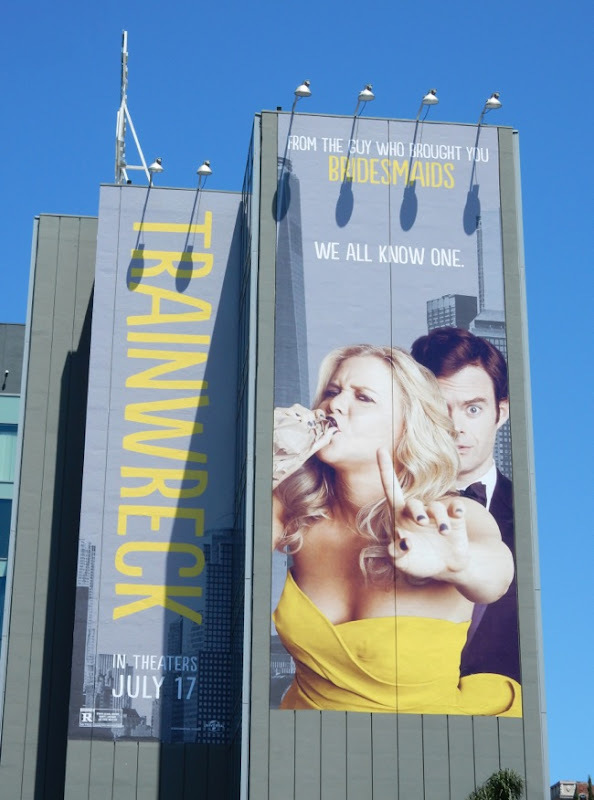 In her first headlining movie she stars as a commitment-phobia career woman, a men's magazine writer, who when interviewing a sports doctor (played by Bill Hader), she realizes that she really likes him. 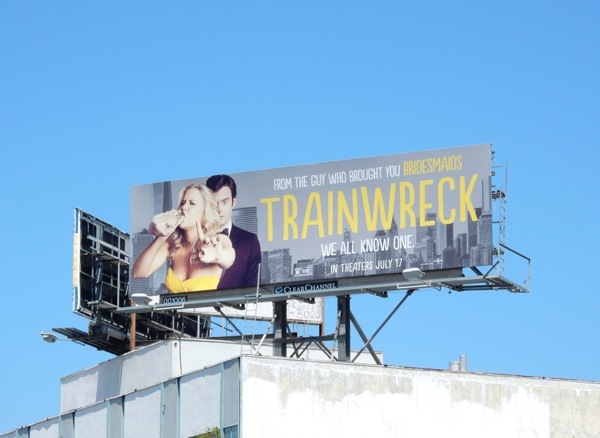 Can this party girl change her ways and try monogamy for a change? 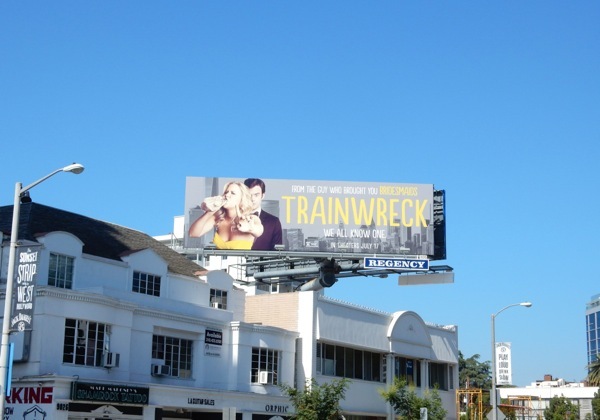 Tilda Swinton also stars as her boss and basketball player LeBron James flexes his funny bones in this movie. 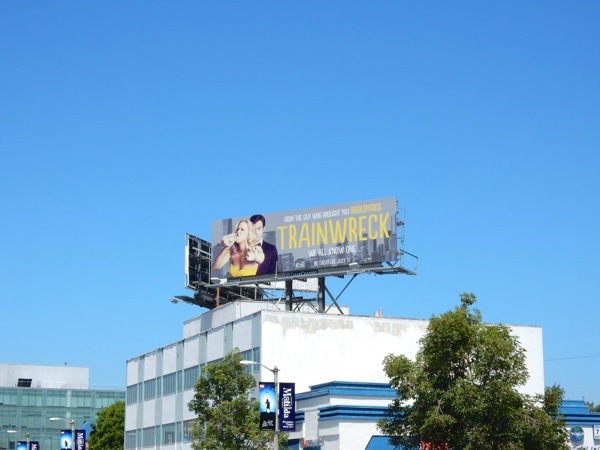 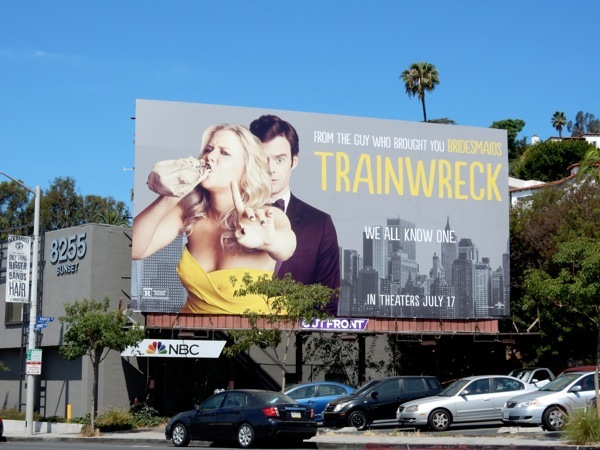 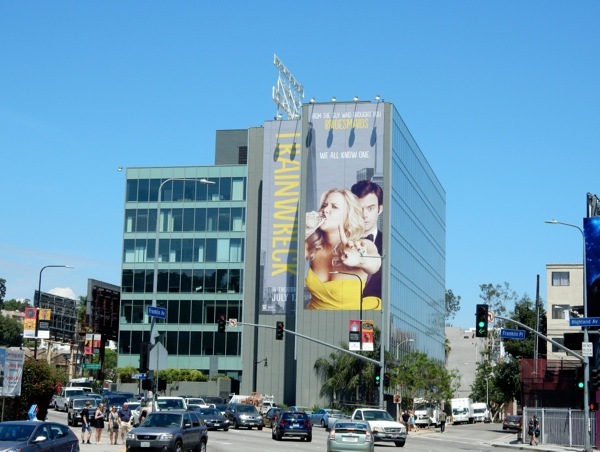 Universal Pictures are certainly going all out to support this Summer comedy, and the standard landscape billboards for Trainwreck were first spied along the Sunset Strip on June 24, plus later high above Beverly Boulevard, whilst a larger landscape creative was snapped further east along Sunset Boulevard on June 30, 2015. 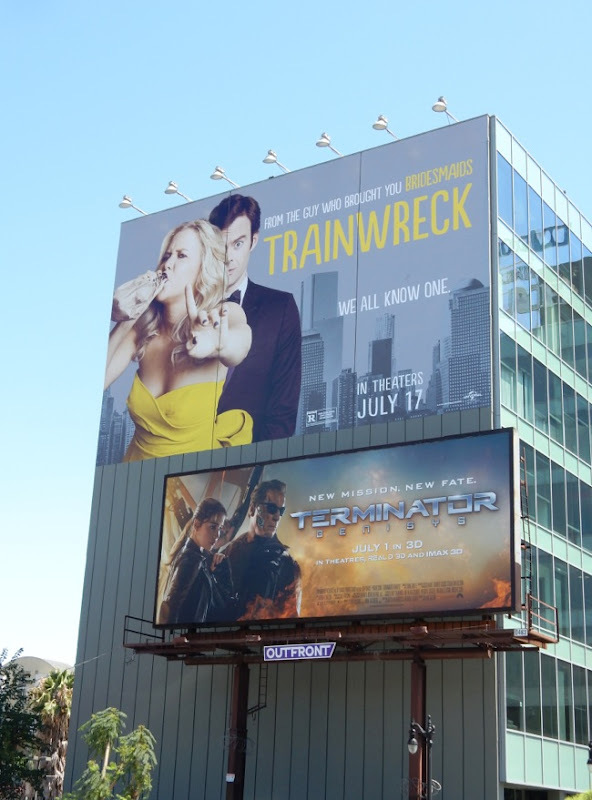 The giant-sized billboards were photographed towering over Hollywood at the busy intersection of Franklin and Highland Avenues on July 2, 2015. 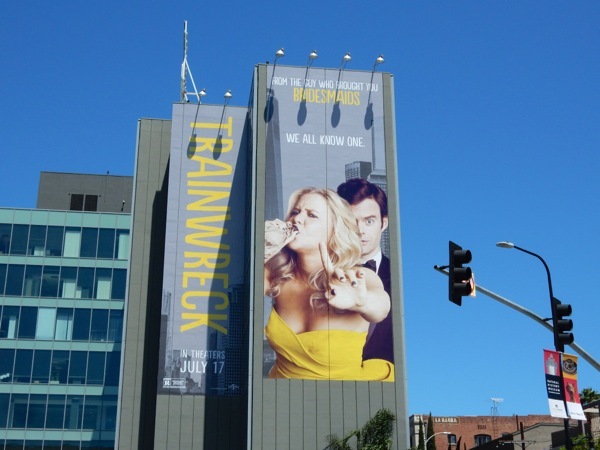 If you're a fan of the funny lady, be sure to also check out these Inside Amy Schumer billboards and this billboard for the 2015 MTV Movie Awards. 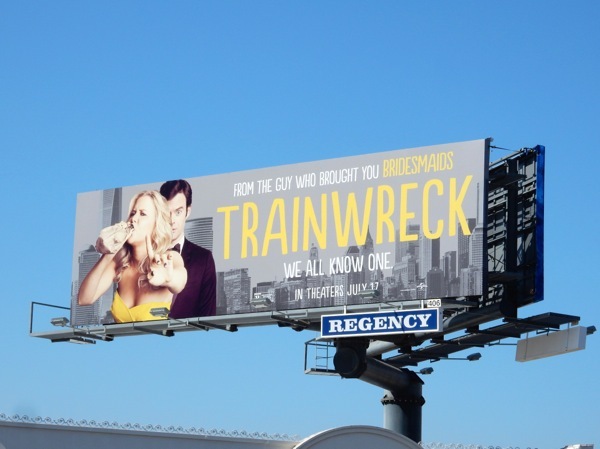 Trainwreck, we all know one and may even be one, but would we ever admit it.